Sophia Bergqvist’s great grandfather was a port shipper, and Quinta de la Rosa was given to her grandmother as a present in 1906. Financial difficulties caused the shipper to be sold in the thirties, but the family kept the quinta and sold the grapes to Sandeman. In 1988, when the laws for production of Port were liberalized, Sophia and her father decided to make their own Port. “We were one of the first to take advantage of the new regulations,” she says. “And then in the 1990s we were one of the first to into red table wine. The initial driving force was an excess of grapes that couldn’t be used for Port.” The red was sold as a house wine to Berry Bros. Today production is two thirds red wine to one third Port. Grapes are purchased (especially for entry level wines) to supplement sources. There’s now a guest house with 19 rooms attached to the winery. A little spicy on the nose, perhaps more peppery really. Palate is still a little tight, with a mineral impression to the finish. Tannins are fine but still a little bitter on finish. Needs another year to let its precision show on palate. Nose shows both mineral influences and hints of raisins. Sweetness on palate blends with coffee and caramel, again with that sense of minerality coming back on finish. Very good balance. Restrained nose with tight sense to black fruits. Sweet, tight and precise on the palate. A linear impression on the finish. Will broaden with time. 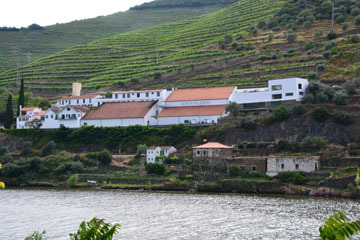 This entry was posted in Wine and tagged Douro, Port, Quinta de la Rosa by Benjamin Lewin. Bookmark the permalink.